The garland which adorned His Divine Grace while placing him in Samadhi has been brought and laid down in His Pushpa Samadhi Mandir at Mayapur. A larger than life size brass murti of Srila Prabhupada has been installed and is being worshipped here. 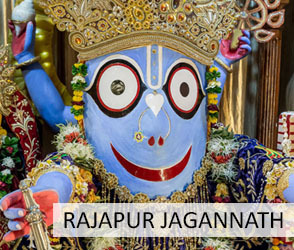 ISKCON devotees worship Srila Prabhupada for He is one of the most confidential servitors of Lord Krishna who has tirelessly spread Krishna consciousness throughout the world. Srila Vishvanatha Chakravarti Thakura says in Sri Sri Gurvastakam prayers, "yasya prasadad bhagavat-prasado" meaning "By the mercy of the spiritual master one receives the benediction of Krsna". 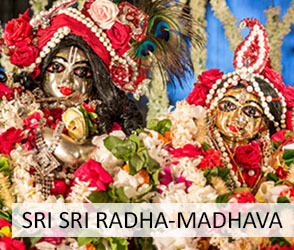 You can now easily do so by facilitating the worship of Srila Prabhupada at His samdhi in Mayapur. 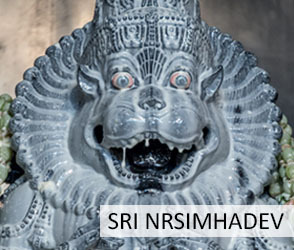 In addition, Nrsimhadev puja will be performed for all donors. All donors with Indian address will also receive Mahaprasad by post. Srila Prabhupada is daily offered bhoga three times: morning (balya), noon (raj) and night. Sponsor all the services (aratis, bhogas and garlands) that are offered to Srila Prabhupada in a day. One Day Seva sponsor will get to honor His raj bhoga Mahaprasad (sufficient lunch for 10 people) on visiting Mayapur. 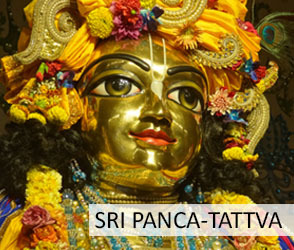 You can sponsor mangal arati, dress or a garland for Srila Prabhupada. 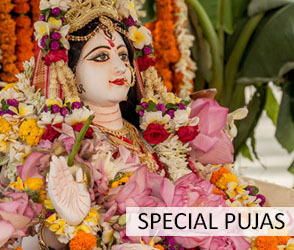 You can also sponsor a garland for the Guru Parampara.